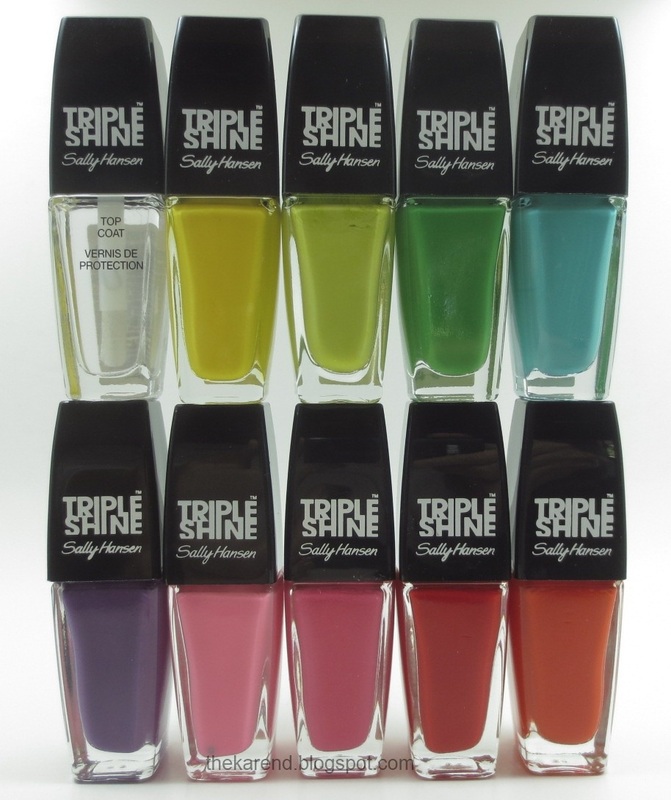 When I first saw the Sally Hansen Triple Shine display at Meijer, I bought a fairly representative (if somewhat skewed toward glitter) sampling of the colors to swatch. I didn't get around to trying them right away, and I picked up a few more the next time I saw the display, and then I think there was a sale on Sally Hansen because I bought some more, so by the time they did make it to the top of my swatching list, I had all 29 colors plus the top coat. The only solution: Skittles swatches. But first, let's look at the bottles. There are nine cremes. 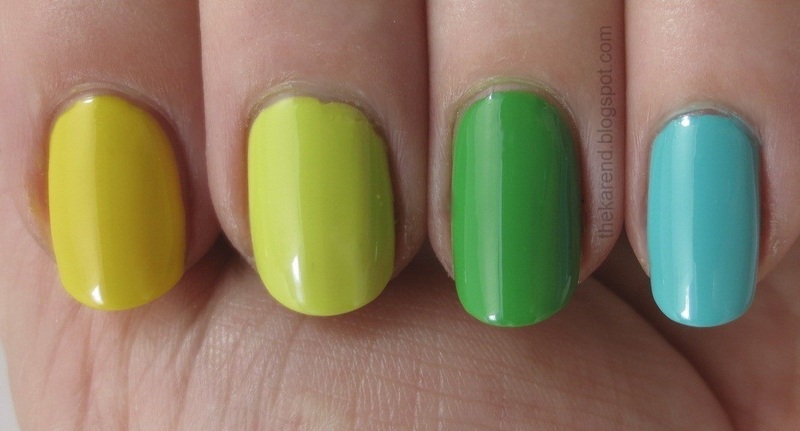 Top row: Top Coat (jumped into the photo to even out the rows), Lemon Shark, Statemint, Kelp Out, Dive In. Bottom row: Vanity Flare, Pixie Slicks, Reef-Raf, Red Snapper, Play Koi. 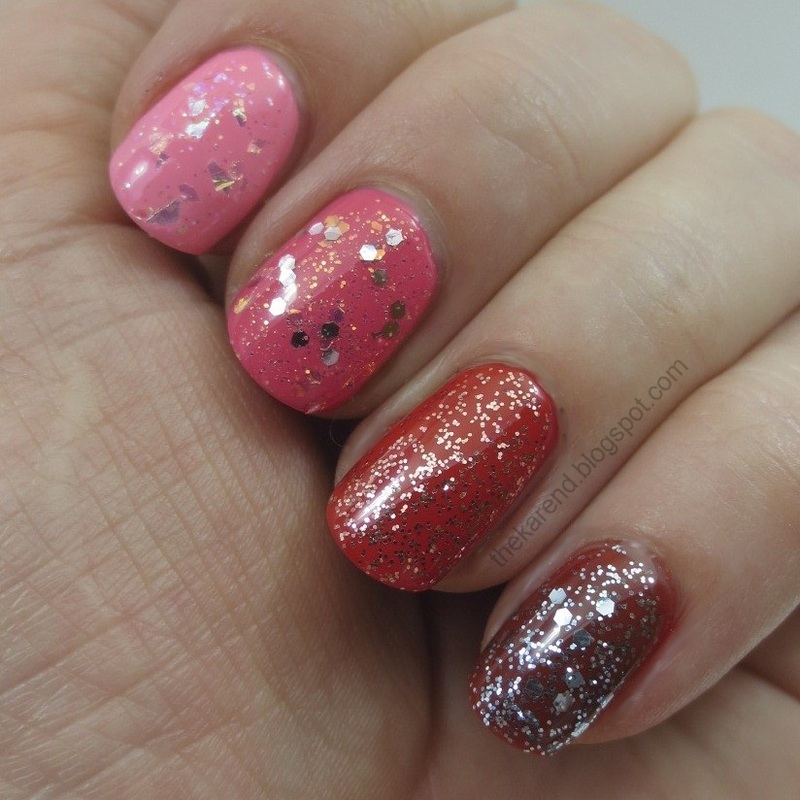 There are eight glitters (some with shredded flakies). Top: Seanic, Fanta-sea, Scale Up, Hypnautical. 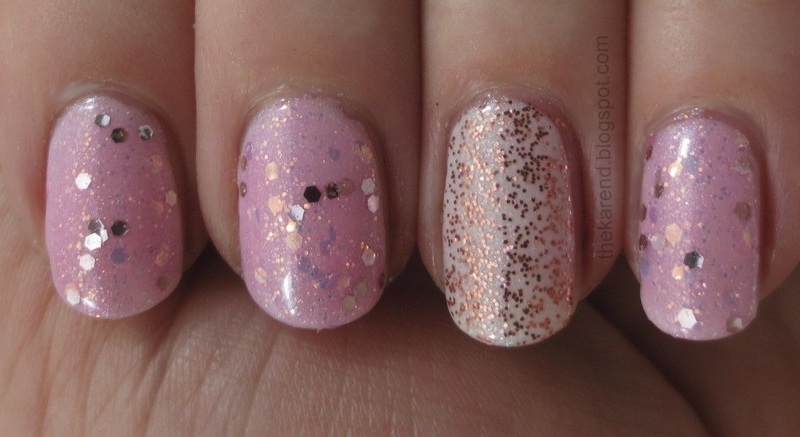 Bottom: Twinkled Pink, Dream Sequins, Pearly Whites, Sparks Fly. There are nine light, bright, or metallic shimmers. Top: Blow Bubbles, Make Waves, Flame On, Oyster Bar. 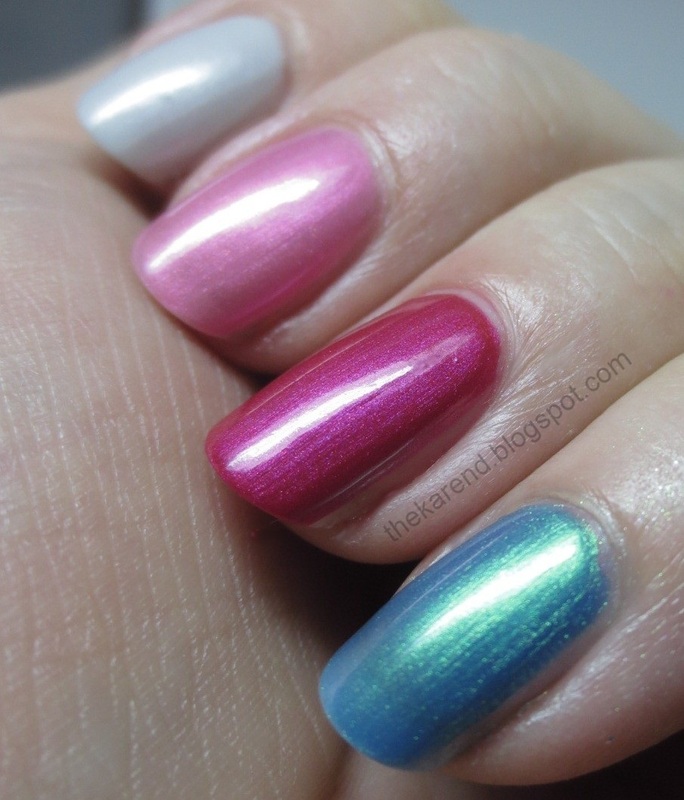 Bottom: Great White, Drama Sheen, Clam Up, Pool Party, Bait Me. There are three dark shimmers: Sparkling Water, Slick Black, Wavy Blue. Before we get to the swatches, let's look closer at one of the bottles. The chunky part of the cap pulls off to reveal a more wieldy one. The brush is wide and flat, similar to the Insta Dri and Complete Salon ones. Okay, finally time for swatches. Left to right below: Lemon Shark (yellow), Statemint (not mint, more like an acid yellow), Kelp Out (green), Dive In (green-leaning turquoise). All are three coats, no topcoat. I might have been able to get away with two coats of Kelp Out and Dive In. I don't know that they're three times as shiny as any other polish but they are shiny enough even without topcoat that I'd wear them that way. Now let's add some glitter and shredded flakies. Left to right, same colors as above plus: Scale Up, Hypnautical, Seanic, and Fanta-sea. I used two coats of the flakies/glitter plus the Triple Shine Top Coat. 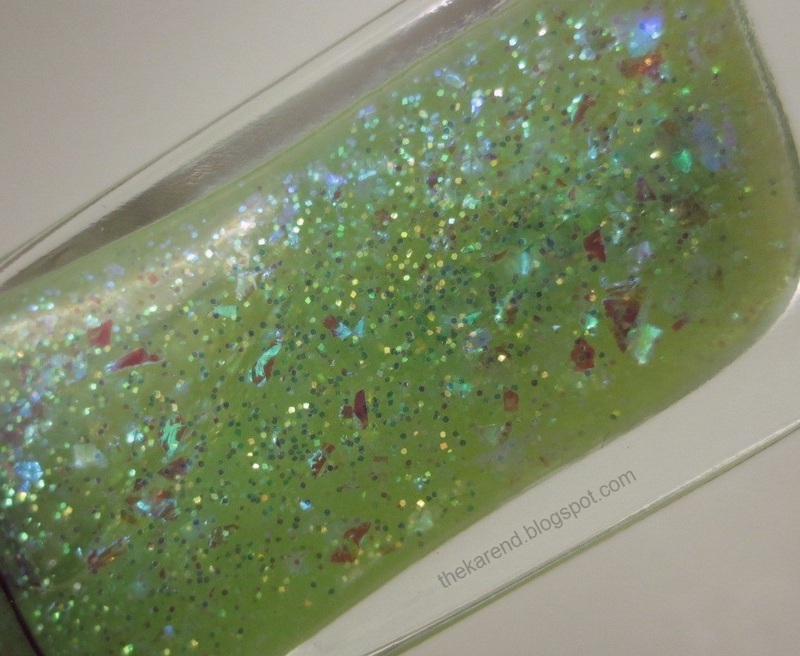 Scale Up has small blue/green/gold/orange iridescent glitter and shredded flakies in a sheer lime green base. Hypnautical is very similar to Scale Up in finish, just different in color. 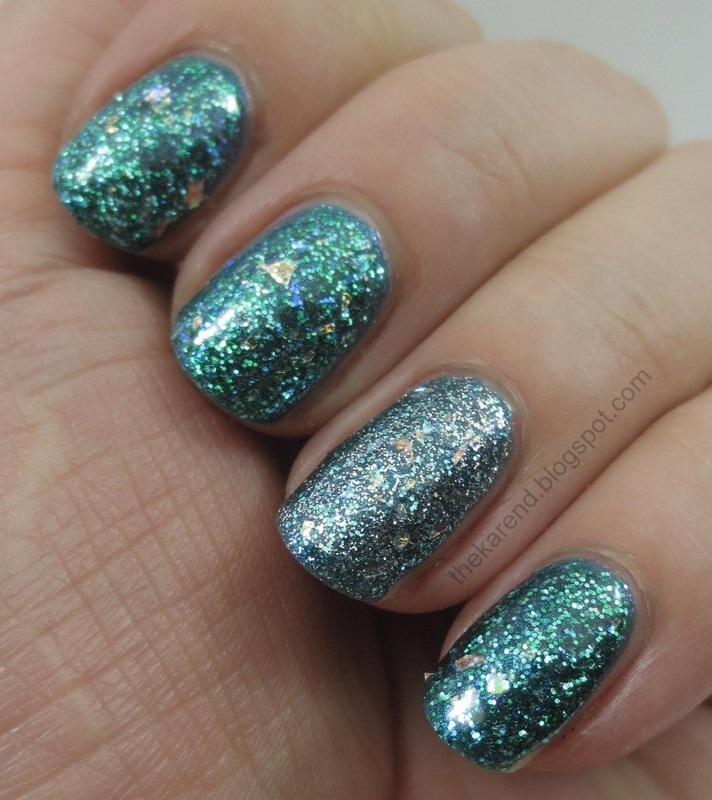 It has blue/green iridescent glitter and shredded flakies in a sheer sea green base. 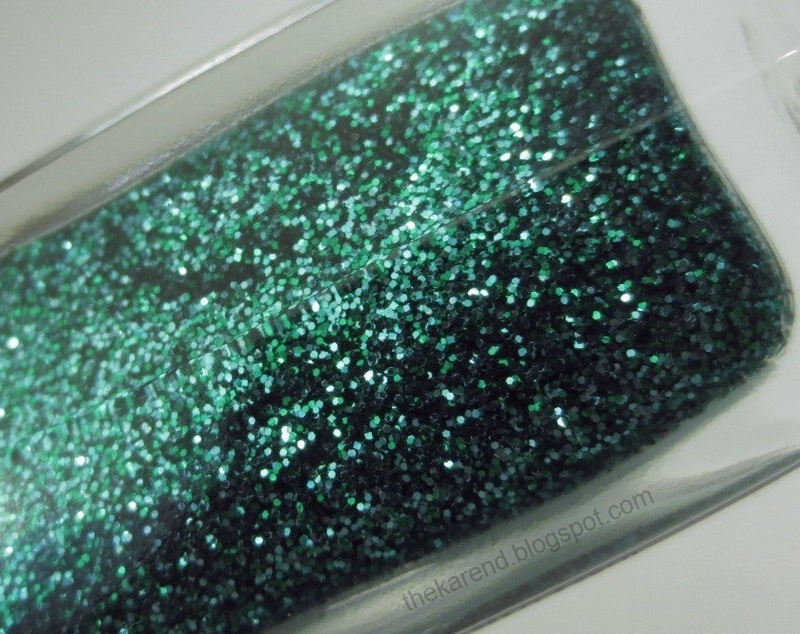 Seanic has uniformly sized small green (and maybe some blue green) glitters in an almost clear green base. 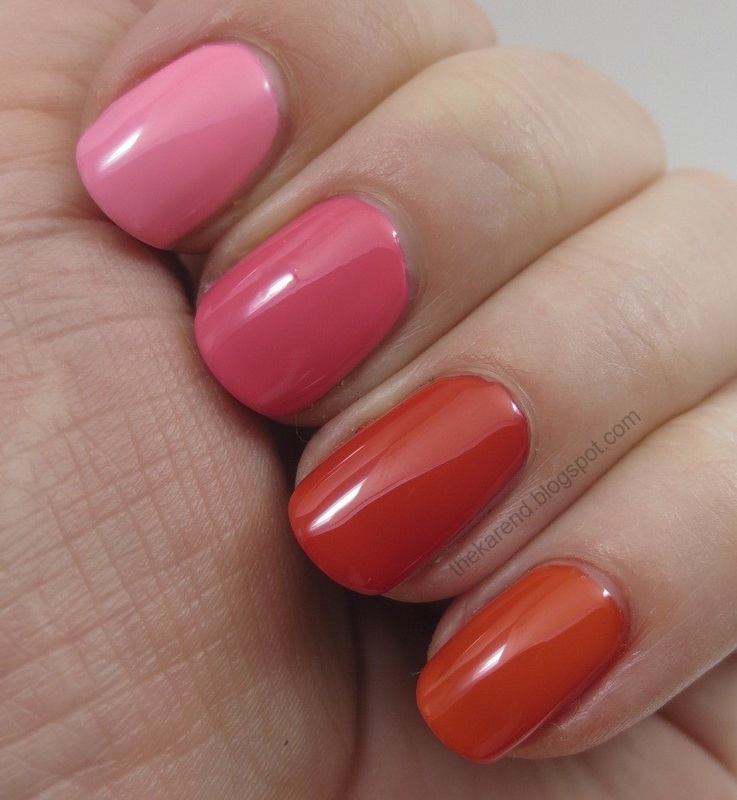 Next up, the warm cremes: Pixie Sticks (medium pink), Reef-Raf (deep pink), Red Snapper (warm red), Playing Koi (orange red). All of these were three coats, except for Reef-Raf, which was two. Again, the shine you see is the color, as I didn't use topcoat. Now come the flakes and glitter: Pearly Whites, Twinkled Pink, Dream Sequins, and Sparks Fly. As for the last set, I used two coats of glitter plus Triple Shine Top Coat. Pearly Whites is iridescent small glitter and shredded flakies in an almost clear milky white base. It's similar to Scale Up and Hypnautical but differs in that it has a much higher proportion of shreds in it. 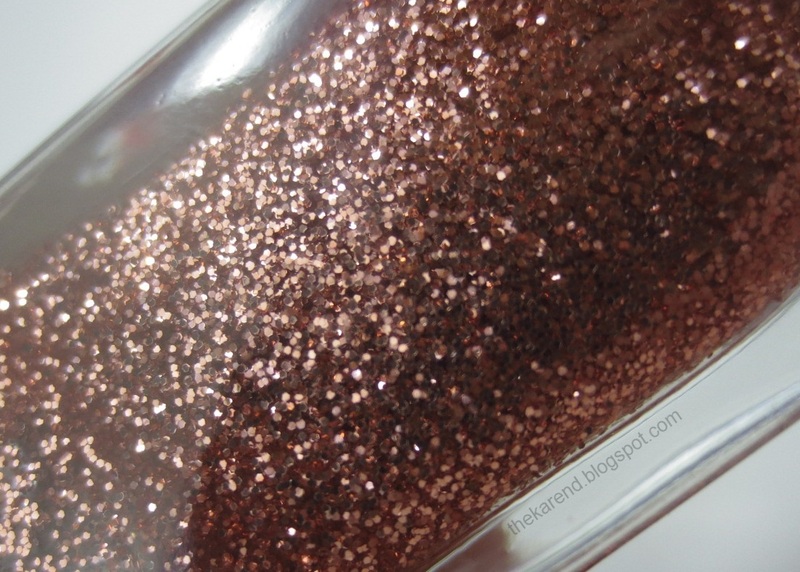 Twinkled Pink has large silver and iridescent golden orange hex glitter and small iridescent golden orange glitter in a sheer medium pink base. 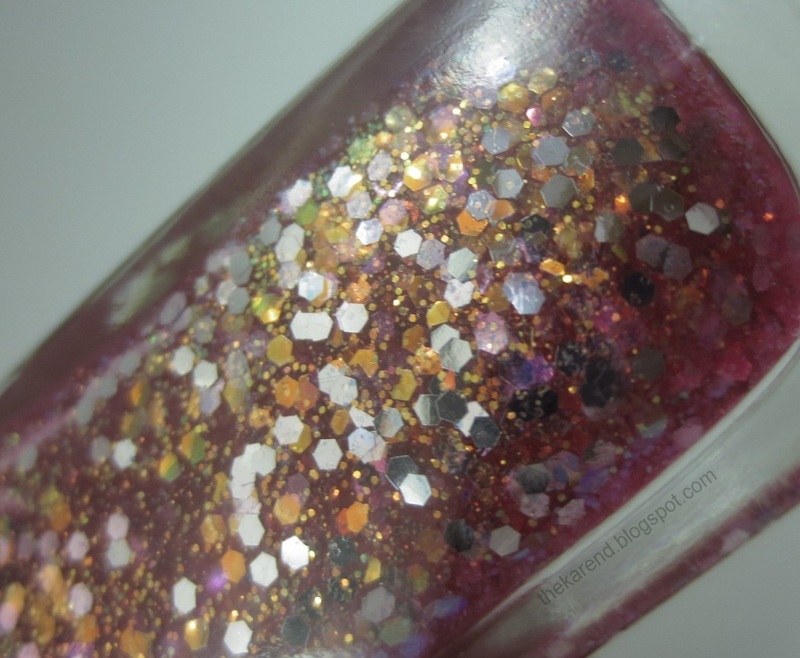 Dream Sequins (I don't usually like punny names but this one charms me) is small copper glitter in a clear base. 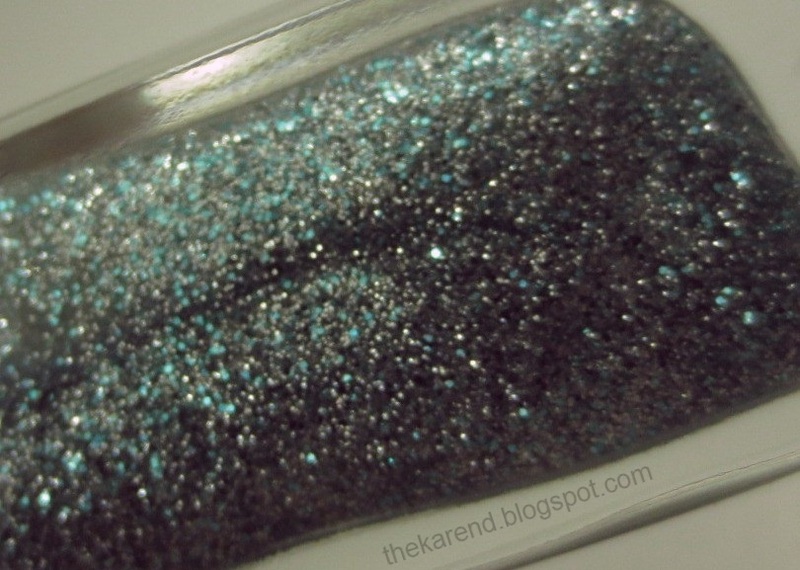 Sparks Fly has large silver hexes and small silver (and maybe also charcoal or dusty blue) glitter in a sheer deep blue base. You can see how tinted the base is by how it changed the appearance fo Playing Koi above to a much darker orange red, more like a brick brown. 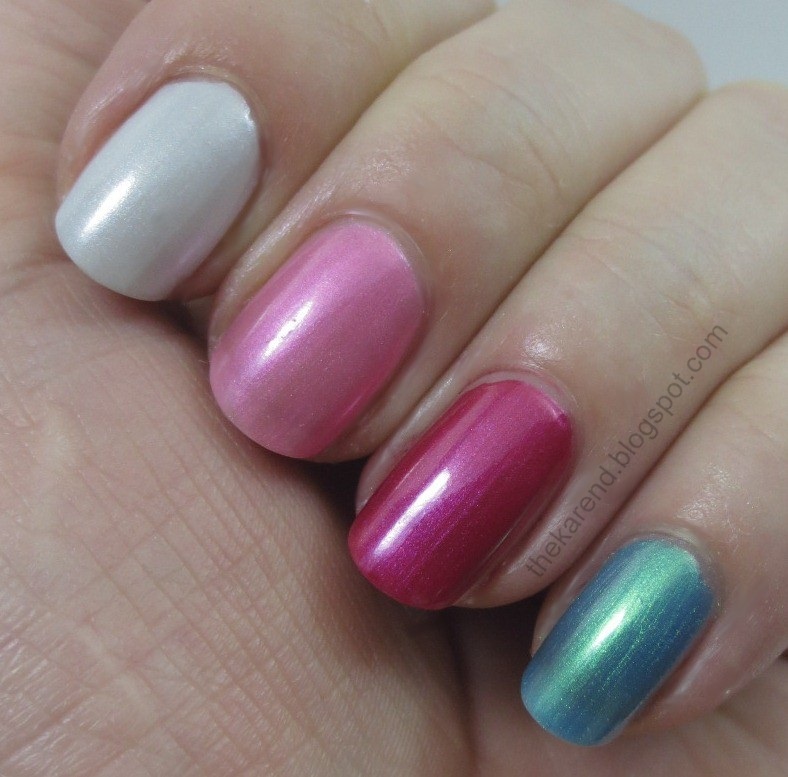 Four light shimmers are next up: Great White (white), Clam Up (pink), Drama Sheen (warm lilac), and Pool Party (baby blue). 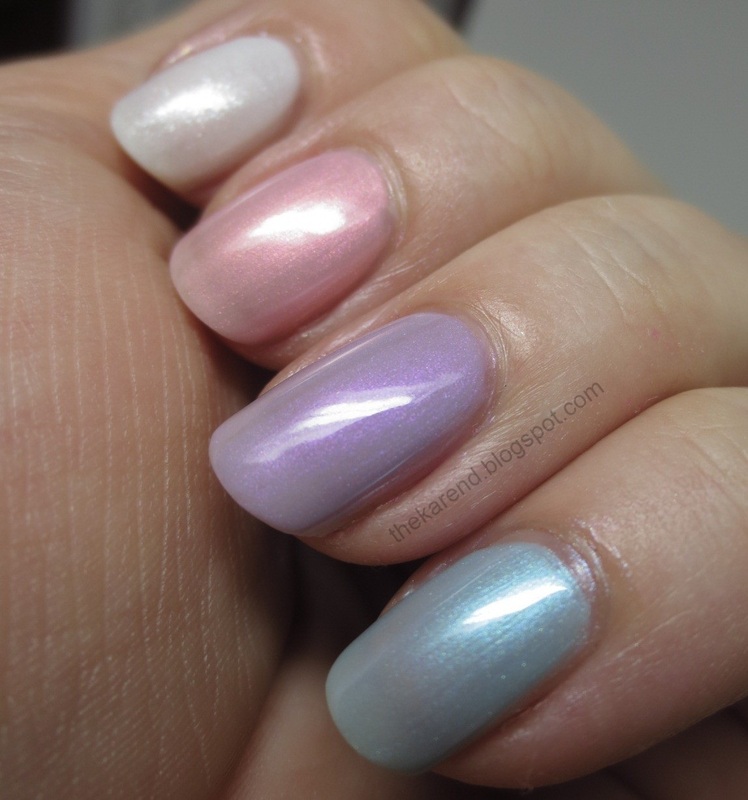 I used three coats of each of these, no topcoat, and that didn't get me quite to full coverage. I don't mind these with a hint of visible nail line, though. Great White is the odd one out in this quartet as far as finish; its shimmer is more flecked while the other three are more pearlescent (and prone to show brushstrokes). Moving on to more shimmers: Bait Me (palest grey), Blow Bubbles (cool medium pink), Flame On (deep pink), and Make Waves (turquoise). I was surprised that the lightest color, Bait Me, only took two coats, while the others were three (and Blow Bubbles and Make Waves really could have used a fourth). 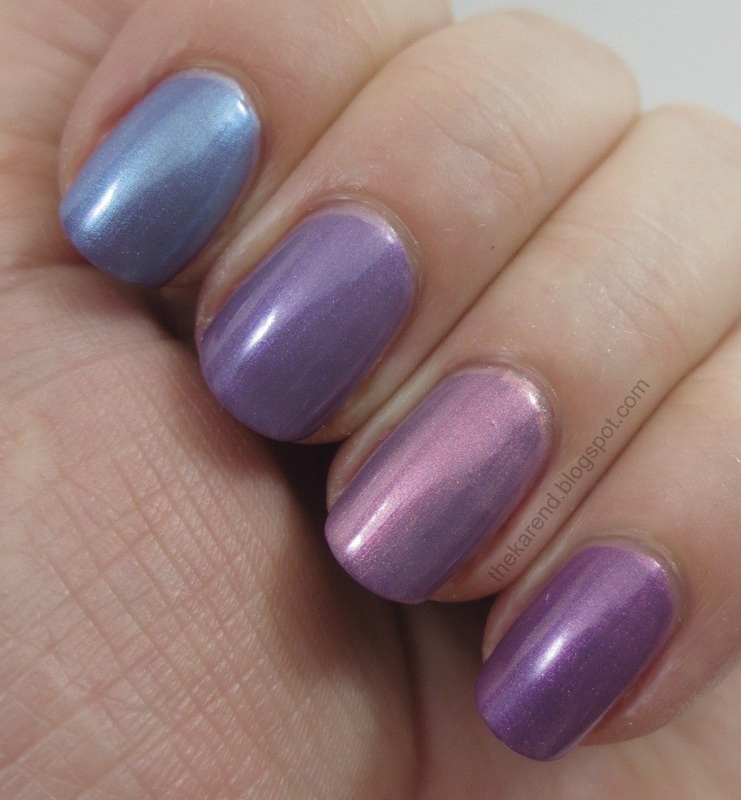 These have the same sort of pearlescent/frosty finish as Clam Up, Drama Sheen, and Pool Party, though Bait Me is so light in color that the overall effect is just glowy. Making Waves has a hint of golden green duochrome about it; this showed up best in direct low light as seen below. 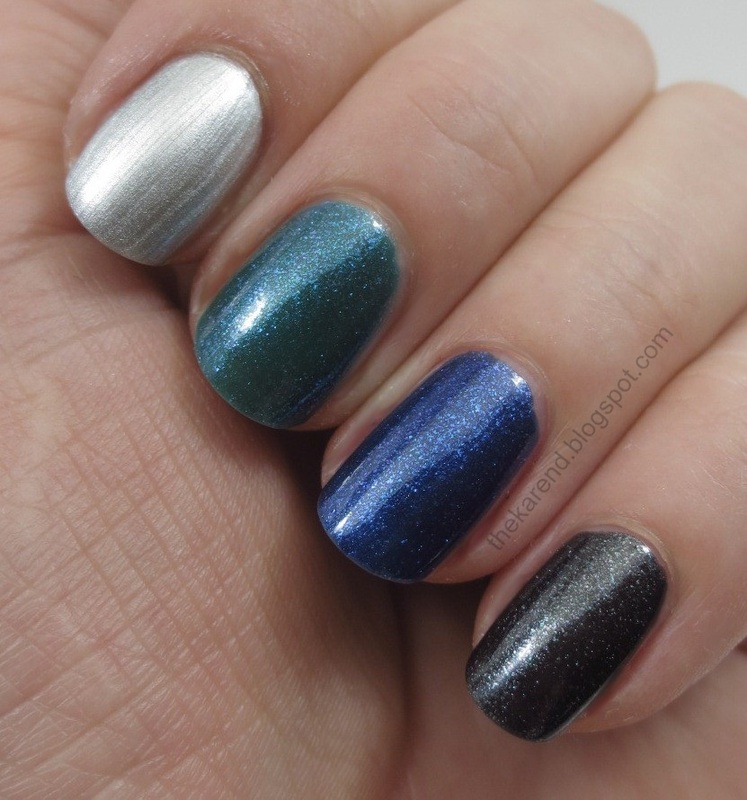 Now we're to the last of the shimmers: Oyster Bar (silver metallic), Sparkling Water (sea green with blue flecks), Wavy Blue (deep blue with bright blue flecks), and Slick Black (black with silver flecks). These were all two coats. I wasn't fond of the brushstrokes in Oyster Bar. I liked Sparkling Water much more; it has a great depth to it. Wavy Blue also has a nice depth to it, and Slick Black sparks lilac and turquoise as well as silver in some lights. If you've been keeping count, you'll notice I'm one color short at this point. The missing one is the first creme I picked up from the line, Vanity Flare, a medium purple. 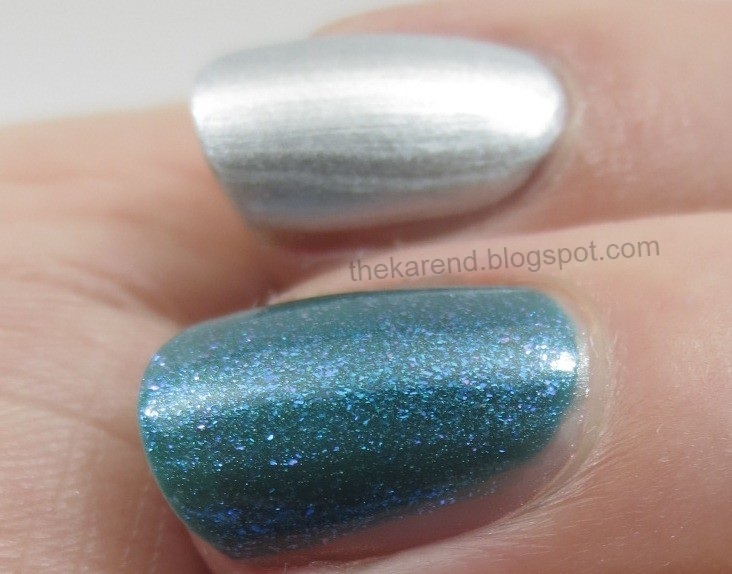 This was a solid two-coater and shiny without topcoat. Because some of the shimmers seemed sheer enough to use as layering polishes, that's what I did next. 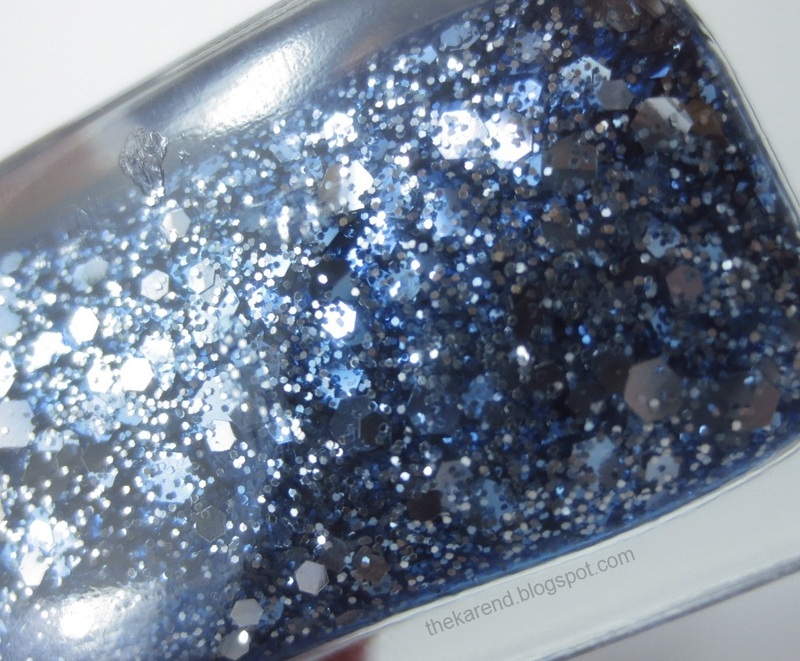 Below you can see Vanity Flare topped with (starting at top left) Pool Party, Drama Sheen, Clam Up, and Blow Bubbles. All of the toppers were one coat except for Clam Up, which got two because I bumped the first one and needed to cover up my oops. Did I stop there? No, I did not. 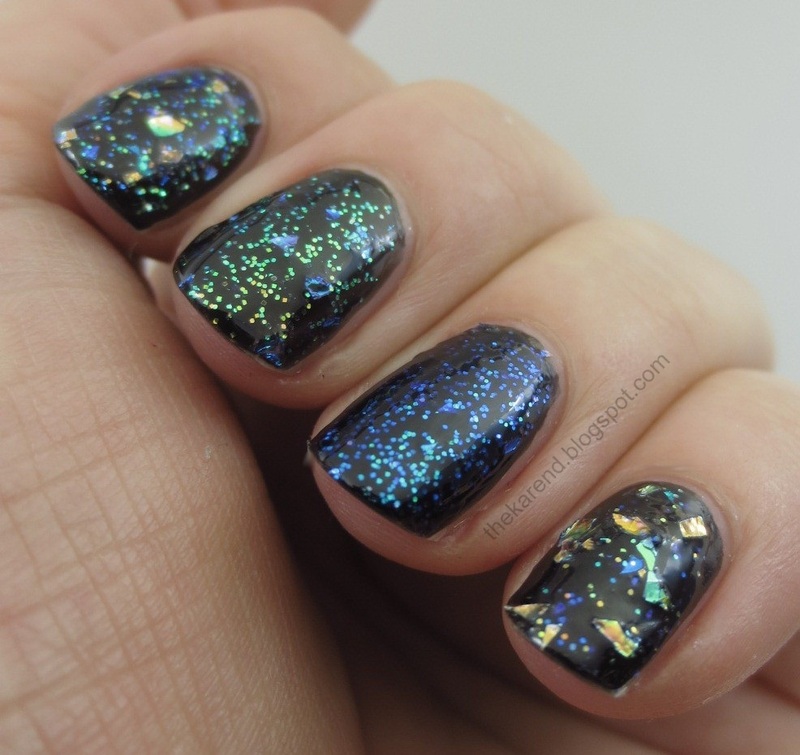 Next I put on a black creme base and grabbed the glitters with the shredded flakies. On my index finger (leftmost in the photo below), I added Scale Up plus Hypnautical plus Pearly Whites. On my middle, just Scale Up. On my ring, just Hypnautical. On my pinky, just Pearly Whites. With the base tints out of the equation, it looked to me like Pearly Whites has a mix of the two kinds of smaller glitters that are in scale Up and Hypnautical with more colorful shreds than the other two, which seem to share the same blue/green ones. Another view. You may be able to see here how these are the sticky up kind of flakes. I did put the Triple Shine Top Coat over all of these; maybe two layers of it would have been a good idea. I was having fun, so I kept playing with layering. 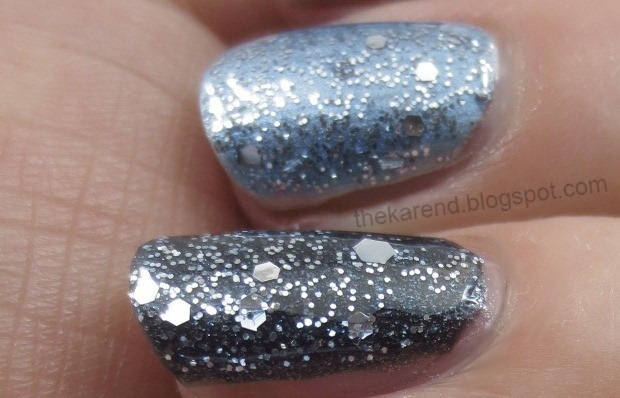 For this next look, I put the silver Oyster Bar on most of my fingers, with Slick Black as an accent nail, then I added two coats of Sparks Fly plus the Triple Shine Top Coat. 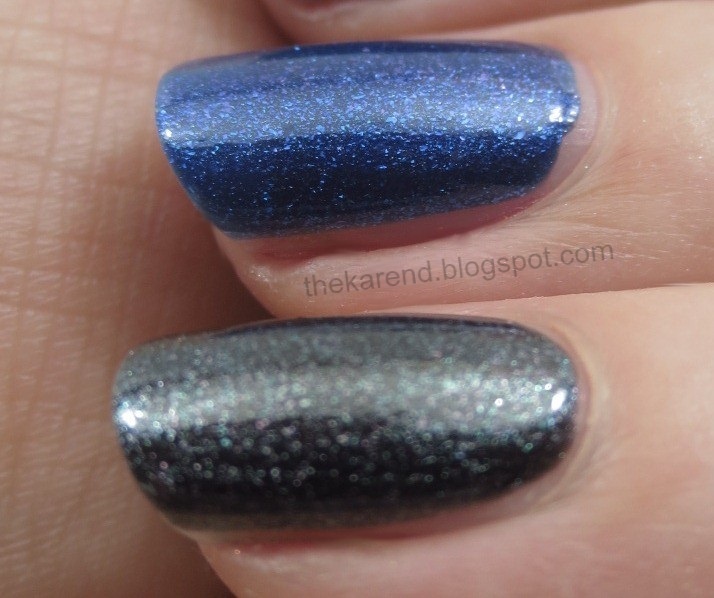 The combination of the glitter and the blue base nicely distract from Oyster Bar's brushstrokes, while the base gives the silver shimmer in Slick Black a blue tone, nicely complementing the silver glitter. But wait, there's more! 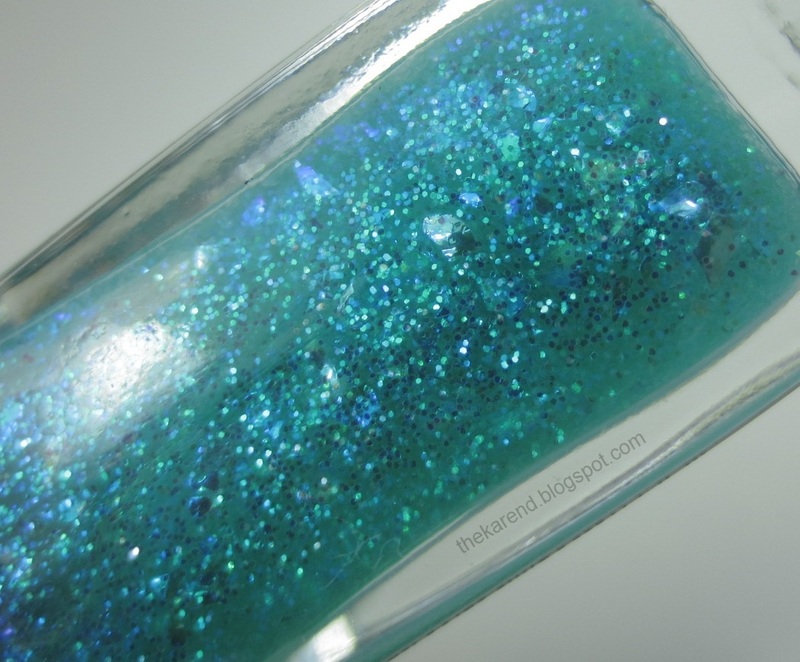 I put on Sparkling Water, then added two coats of Seanic with two coats of Fanta-sea as an accent nail (then topcoat). I thought these worked really well together. Even I was running out of steam at this point, but I did one last look with Great White as a base and Twinkled Pink with Dream Sequins accent on top (plus topcoat). I liked these together very much. So there you have it, the latest line from Sally Hansen. I tried to do a count of all the different lines I have from them and gave up around the time I reached three dozen, and I wasn't even considering all the updated bottle styles within a line like Hard as Nails. Granted, Sally Hansen and I go way back, but still that seems like a lot of variation. Taken as a whole, I think Triple Shine has a good range of colors and finishes, especially for someone like me who tends toward the cooler hues. If I really liked gold, I might have a bone to pick as that color seems underrepresented. Ditto vampy cremes. 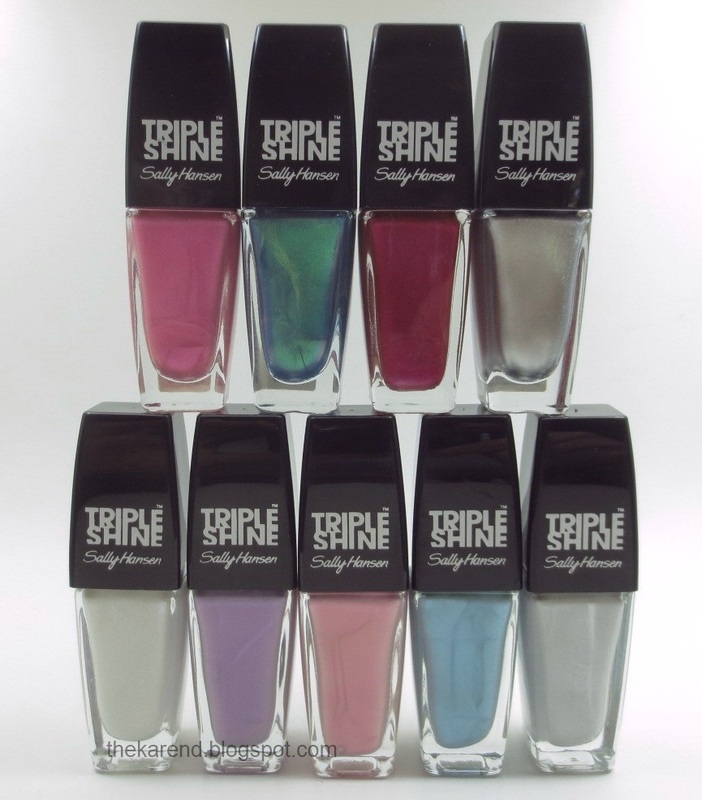 I wonder if next year we'll see limited edition Triple Shine collections like we do now for Complete Salon Manicure, Insta Dri, and Xtreme Wear. That would be a way they could work in some more variety. I'm curious about the preponderance of water/fish themed names; seems a narrow focus for a permanent line but maybe they wanted to get people thinking water is wet and wet is shiny and this line is about shine. Given the number of bright and funky colors and all the glitters here, I get the sense that this line is targeted toward younger, hipper customers (in contrast to something like Smooth & Perfect, which definitely seemed aimed at a more mature audience). I don't really know about any of this stuff; I'm not a marketing person. My favorites here are Statemint (despite the name), Fanta-sea, Twinkled Pink, Drama Sheen, and Sparkling Water. I like Vanity Flare, of course, since it's purple, but I do have a lot of very similar cremes already, whereas I don't have hardly any acid yellows like Statemint. See anything you like? What's your opinion on the line as a whole? Fanta-Sea is my fave for sure! 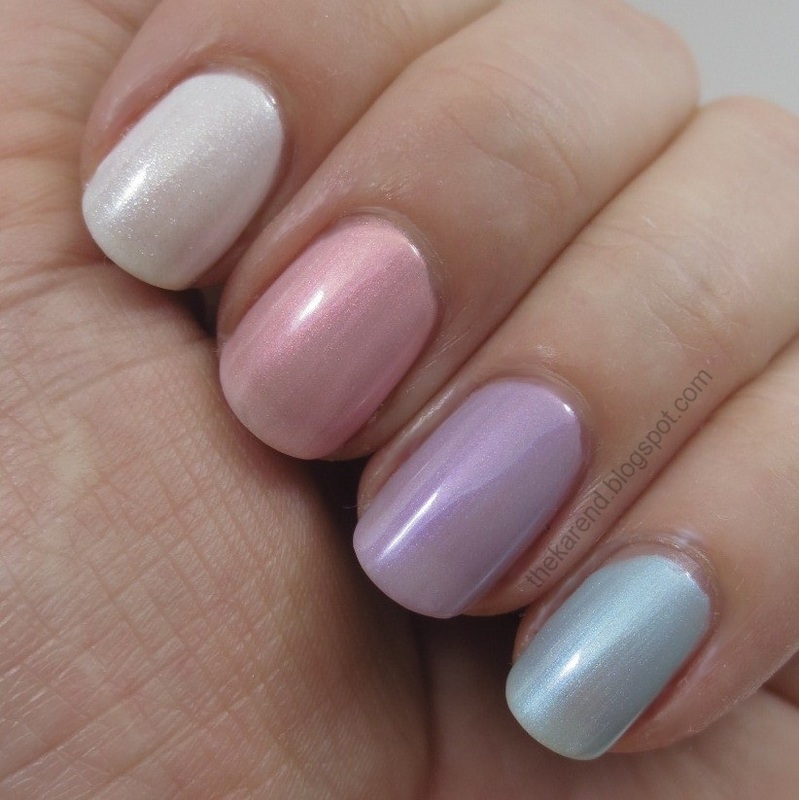 They are so pretty, I like the majority - but 3 coats are a bit too much! But pretty! 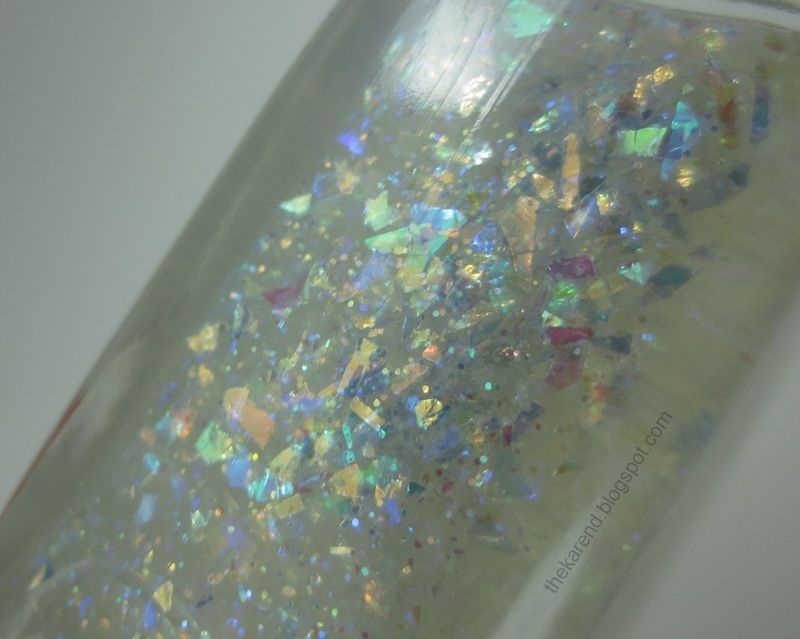 I haven't picked up any of these yet though some of the glitters do interest me. I hate those brushes though. What is up with that? Thanks for the comprehensive post. The water names are because the line defends against water more than most nail polishes, according to Sally Hansen. 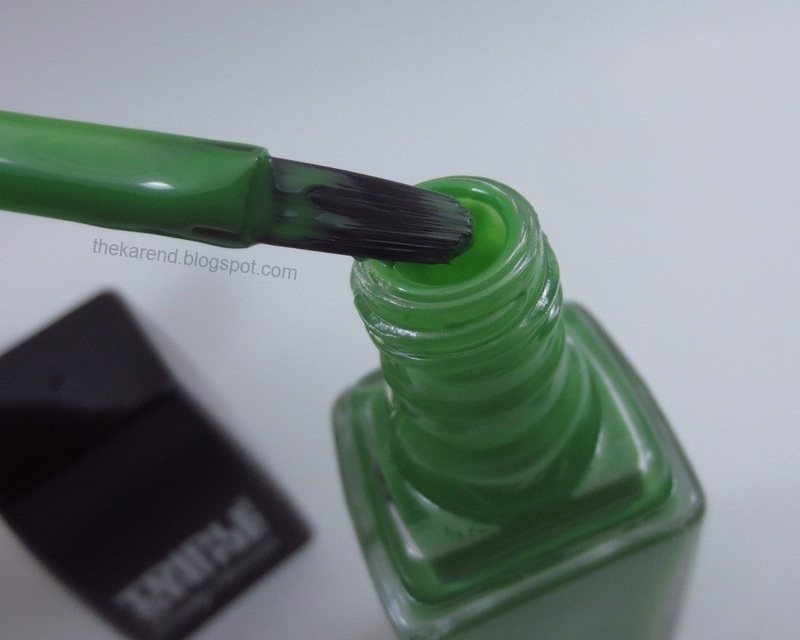 I know my nail polish chips much easier when soaked in water, so I'm interested in seeing how the Triple Shine nail polish holds up.